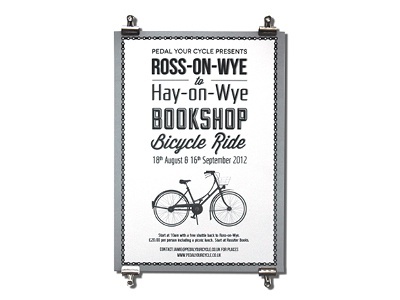 I have designed a poster for Pedal Your Cycle who provide bike hire, rides and tours in the Herefordshire area. This particular ride was to go from Ross-on-Wye to Hay-on-Wye stopping off at bookshops along the way and having a picnic lunch. I wanted a vintage theme to the poster so I went for a simple illustrative style for the bike and the style of bicycle with the basket is what you could hire to ride on for the day.